This article is about the video game for the Super Nintendo Entertainment System. 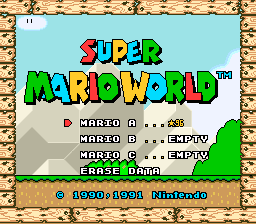 For other uses, see Super Mario World (disambiguation). "SMW" redirects here. For information about the game known as "Super Mario Wii" in South Korea, see Super Mario Galaxy. Not to be confused with Super Mario 3D World. Super Mario World (subtitled Super Mario Bros. 4 on the Japanese logo) is a 2D Mario platform game and a launch title released for the Super Nintendo Entertainment System in 1990, developed by Nintendo EAD. Being a sequel to Super Mario Bros. 3, the game retains much of the elements that debuted in Super Mario Bros. 3 such as the world map and Koopaling boss fights while introducing a large variety of new gameplay mechanics, such as an expanded and less linear world map and the ability to save the game. Introduced in Super Mario World is Mario's sidekick, Yoshi and his species that share his name, where he serves as a playable mount for the Mario brothers with his own unique abilities and gameplay style. The game was produced by Shigeru Miyamoto, featuring music composed by Koji Kondo, and graphics designed by Shigefumi Hino. Miyamoto has stated that ever since they finished Super Mario Bros., the design staff wanted to have Mario ride a dinosaur. It was believed to be impossible technically until the Super NES was developed. According to Miyamoto, sixteen people were involved in the creation of the game, and it took about three years to make. At some point during the game's development, it was meant to be released in North America and Europe under the full Super Mario Bros. 4 title, but it was later shortened to simply Super Mario World. Miyamoto has stated that this is his favorite Mario game. The game was released to best-selling status on the SNES, received large amounts of critical acclaim, and is commonly seen on Nintendo's best games of all times on various critic listings. Much of the game's introduced characters, game mechanics, and artistic themes influenced later titles in the Mario series, where the character Yoshi was popular enough to receive a series starring him. 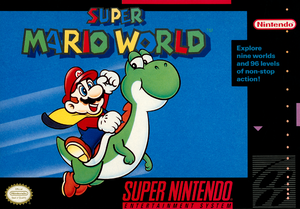 The game was followed in 1995 by a prequel, Super Mario World 2: Yoshi's Island, which is set many years before the events in Super Mario World. The game has spawned various nongame media such as a cartoon series that is based on the game which debuted on September 14, 1991, one month after the American release. Various manga adaptions of the game have sprung up, one notable series being the Super Mario-Kun, which has their first volumes based off Super Mario World released in 1991 and is still ongoing today. Super Mario World is included in the Super Mario All-Stars + Super Mario World compilation title released in December 1994. A port of Super Mario World was later released on the Game Boy Advance as part of the Super Mario Advance series, titled Super Mario World: Super Mario Advance 2. The original version was also re-released on the Wii and later the Wii U and New Nintendo 3DS Virtual Console. 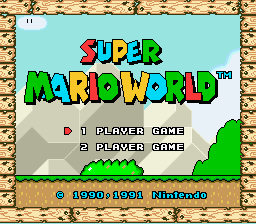 Super Mario World is one of the included titles in the SNES Classic Edition. After Bowser's previous defeat, Mario, Luigi, and Princess Toadstool decide to recuperate in Dinosaur Land. Meanwhile in Dinosaur Land, the Koopa King and his Koopalings trap Yoshi and his friends in enchanted eggs, eliminating the opposition as they secretly rebuild their forces. Shortly upon their arrival, the Mario Bros. realize that Princess Toadstool is missing. While searching, they find the Koopa Troop army. Upon freeing the friendly Yoshi, he exclaims that the Koopas have invaded, confirming that Peach's persistent captor has indeed returned and taken the opportunity to claim the princess. As Mario and friends travel through Dinosaur Land, they uncover the Valley of Bowser, where Bowser is fought on his castle roof in his Koopa Clown Car, holding Princess Toadstool hostage. Upon his defeat, he gently drops the princess and retreats. Princess Toadstool rewards Mario or Luigi with a kiss as fireworks celebrate freedom, signifying that their vacation can resume with their new good friends. The reunited team returns to Yoshi's House where they and three other Yoshis watch the Yoshi eggs hatch into babies, removing the spell. After saving the Mushroom Kingdom from Bowser and the rest of the Koopas in Super Mario 3, Mario and Luigi needed to recuperate from their adventures. Together they agreed that the best place to vacation was a magical place called Dinosaur Land. But while Mario and Luigi reclined on the beach for a relaxing nap, Princess Toadstool disappeared, apparently seized by evil forces. After searching for hours for their missing friend, Mario and Luigi came upon an enormous egg in the forest. Suddenly the egg hatched, and out popped a young dinosaur named Yoshi, who proceeded to tell Mario and Luigi a sad tale of how his dinosaur pals were sealed in similar eggs by a group of monstrous turtles. "Monstrous turtles!," exclaimed Luigi. "Bowser and his bunch have returned!" Mario slowly nodded his head in agreement and, along with Luigi and Yoshi, set off across Dinosaur Land to find the Princess and to free Yoshi's friends. As they began their journey, Yoshi handed Mario a beautiful cape. "This may help you," Yoshi said. "Some say it has magical powers." With a little luck (and help from a magic cape), our hearty crew can defeat the seven worlds of Bowser's Krazy Koopa Kritters. Many locations are well-hidden so explore everywhere and try everything. Not all locations have to be explored to rescue the dinosaurs and save Princess Toadstool, but there are many "starry" treasures to be found in far-reaching places. You'll need to search all areas to find what kinds of treasures are there… in Super Mario World. As a 2D platformer, the object of the game is to get to the Giant Gate to advance to the next level before the timer runs out. Mario (or Luigi) can jump over and on top of various platforms and obstacles and stomp on various enemies to defeat them. In addition to these basic moves, Mario can spin-jump to destroy certain types of blocks and enemies, whereas the or lets Mario dash if held down. When Mario presses either of those buttons next to some items, he can pick them up and carry them through the level as the buttons are held. When Mario hits the Giant Gate at the end of the level, if he touches the vertically moving bar between the gates, he gets awarded star points depending on how high the bar was when he touched it. If he collects 100 star points, Mario can play a bonus minigame that helps him earn extra lives. Some levels contain a Midway Gate, which not only powers Mario up to Super Mario when touched, but serves as a checkpoint for Mario to respawn near if he gets defeated in the level. In order to obtain most power-ups, Mario has to hit various blocks which may contain items. The basic Super Mushroom, which turns Mario into Super Mario, causes Mario to grow bigger and allows him to sustain an extra hit. When Super Mario hits a block, usually a more powerful item spawns in the Super Mushroom's place, such as a Fire Flower or the newly introduced Cape Feather. Introduced in Super Mario World is the item reserve system, where Mario can hold onto extra items should he find them while in powered up forms; players can manually drop their reserve item by pressing . If Mario gets damaged and turns into regular Mario, the reserve item automatically deploys. A newly introduced character and power-up in Super Mario World, Yoshi, appears when Mario hits certain blocks. Mario can ride Yoshi when he jumps on him, who helps Mario with his own unique traits and abilities. If Mario gets touched by an enemy or a damaging obstacle while he is in his normal form, he loses a life. If he gets damaged by an enemy while in a power-up form, he reverts to his normal form. If Mario loses all of his lives, the player receives a game over and is prompted to continue from their last save with five more lives. Some obstacles defeat Mario instantly regardless of what power-up he has, such as falling into pits or lava, getting crushed, or not making it to the goal in time. 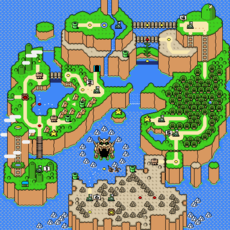 Every time Mario gets defeated, he gets sent back to the world map. 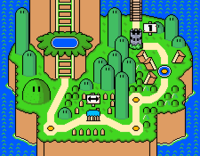 Super Mario World returns the world map system from Super Mario Bros. 3 with more expanded features. Rather than having levels and worlds segmented, all worlds and levels are seamlessly connected to each other, with a heavier focus on multiple paths per level clearance, and thus creating a less linear map, with a few exceptions. Typically, prior to entering new areas, Mario has to defeat a castle boss, usually one of Bowser's seven children, the Koopalings. Once they are defeated, the castle they reside in is destroyed and cannot be replayed, though in international versions of the game they can be replayed if players hold and on the castle's remains. World Map: The colors of the map become fall-themed, like grass and the trees of the Forest of Illusion turning orange. Koopa Troopas and Winged Koopa Troopas: Change into Mask Koopas. Jumping Piranha Plants: Change into Jumping Pumpkin Plants. Bullet Bills: Change into Pidgit Bills. 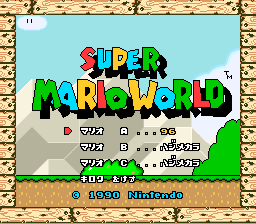 Super Mario World contains nine worlds and 96 levels in total. Almost all worlds contain four regular levels and at least one secret level. Levels marked in yellow contain one exit, while levels marked in red contain an alternative, secret exit. Other points of interest include the Switch Palaces, Warp Pipes, and the Super Star-shaped portals to the Star World that are unlocked only when players find the associated secret exit. Switch Palaces activate respectively colored permeable Dotted Line Blocks and turn them into solid ! Blocks that can be stood on or hit from below. Once Switch Palace levels have been completed, they cannot be visited again. Warp Pipes warp players to different areas of the map, usually to different worlds altogether. Finally, Yoshis cannot be taken into castles, fortresses, or Ghost Houses, though Yoshi remains outside for the player if they exit the level. In castles, players have to defeat the Koopalings, while in fortresses, players need to defeat Reznors. Yoshi's Island Yoshi's Island is mainly a grassy plains-related world that does not contain any underwater levels. The main enemies in this world include Monty Moles, Koopa Troopas, Rexes, and a few others. Iggy is found in his castle at the end of this world. Completing this world leads to Donut Plains. It also contains the Yellow Switch Palace. Donut Plains Donut Plains is the second world in the game. It is known for featuring the first Ghost House and for being the first to have a course with multiple exits. The Cape Feather is utilized frequently. The name of this world is a reference to its unusual shape. It has two Ghost Houses, the Green Switch Palace, and Castle #2. Vanilla Dome Vanilla Dome is a big cavern full of sparkling diamonds and contains a Ghost House, a large lake, the Red Switch Palace, and Castle #3. It also contains lava pools with the large Blarggs living within them. Twin Bridges Twin Bridges is semi-sky based, as it has sky and land levels. It contains one underwater level and the third portal to the Star World. Forest of Illusion The Forest of Illusion is a maze-like forest, where Mario or Luigi may sometimes have to find the secret exit on a level in order to progress, as the normal exits create a circle leading nowhere. It contains the Blue Switch Palace, a Fortress, and Castle #5. Chocolate Island Chocolate Island is an island on the southeastern side of Dinosaur Land. The boss here is Wendy O. Koopa. This is the only world where Mario and Luigi can find Dino-Rhinos and Dino-Torches. Valley of Bowser The Valley of Bowser is, as the name implies, Bowser's base of operations. 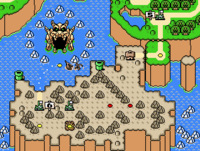 The entrance to the Valley of Bowser appears after passing through the Sunken Ghost Ship. It is mostly cave-themed and contains a Fortress, Castle #7, and Bowser's Castle. Star World The Star World is a mystical road far above the Mushroom World, and is linked to various locations around the world. It consists of five stars, each of which serves as a warp point. Special Zone The Special Zone is the final and and most secret world. It can be accessed after completing the Star World and taking the secret exit from Star World 5. This world is known for containing the most difficult levels in the game, and each level has its own unique gimmick. Mario and Luigi are the main playable characters. In 2-player mode, Mario is controlled by Player 1 and Luigi is controlled by Player 2. If Mario loses a life or completes a level in 2-Player mode, Luigi comes into play until he does the same. The two may also share extra lives on the world map. The two have identical mechanics. Dolphin Sea creatures that give Mario rides in water levels. They move in jumping arcs or can jump up and down. In Japanese versions of the game, they can be eaten by Yoshi while they are unable to be eaten in international versions. Princess Toadstool The princess of Mushroom Kingdom who is kidnapped by Bowser during the vacation. The main objective of the game is to rescue her from Bowser. Yoshi Mario's sidekick who requests for Mario's assistance. After he is freed from his egg, he can give rides for Mario and eat intrusive enemies. In addition to Mario and Luigi, Yoshis of four different colors appear in the game, which may be controlled once acquired and help the Mario Bros. in many levels of the game. Green Yoshis hatch out of Yoshi Eggs, usually found in various blocks throughout the game. If a Yoshi Egg is found but the player already has a Yoshi, the egg instead provides a 1-Up Mushroom. If a Yoshi gets hurt, they run off, requiring the Mario Bros. to chase them down if they want to ride them again. Yoshis can additionally provide an extra jump boost to Mario and Luigi if they jump off the Yoshi. Some levels contain Berries, where Yoshis can eat them and produce eggs from them if enough are eaten. Yoshis can eat most enemies, though they cannot immediately swallow most shells, requiring them to spit the shells out before they eventually swallow them. Red, blue, and yellow Yoshis are uncommon in Super Mario World. They are first encountered in the Star World, which is accessible by using the five Star Roads found throughout the game. They are found as Baby Yoshis, small and unable to be ridden. However, through carrying them, the Baby Yoshis eat the enemies they touch. When five enemies are eaten, they transform into adult Yoshis, and can be used normally. Baby Yoshis of all colors hatch from the Yoshi Eggs rescued from the castles during the ending credits of the game. Yoshi Green Yoshis are able to eat enemies using their long tongues and jump on spiked foes without taking harm as well as walk across Munchers. They can use a Koopa Shell's power depending on the color of the shell. Red Yoshi Red Yoshis can spit out any Koopa Shell in the form of three fireballs. These fireballs turn a variety of enemies into coins. They are found as a Baby Yoshi in Star World 1 or Star World 4. Blue Yoshi Blue Yoshis can fly regardless of what color the Koopa Shell is in their mouth. Additionally, a Yoshi can become Blue Yoshi if he touches Yoshi's Wings, which appear in some levels and act as shortcuts to the end of the stage. They are found as a Baby Yoshi in Star World 2. Yellow Yoshi Yellow Yoshis can create small sand clouds when they hit the ground while they carry a Koopa Shell in their mouth, defeating enemies within the range of the cloud. They are found as a Baby Yoshi in Star World 3 and Star World 5. This enemy tosses hammers from his swooping platform, attempting to attack Mario. A large mace on a chain. The chain is harmless; it swings behind Mario. A giant, slow-moving bullet. The cannons they are fired from are not seen anywhere in the game. A giant metal ball thrown by Bowser. A lava dinosaur. Only its eyes are visible before it dips back into the lava and lunges at Mario. A fish wearing goggles. It swims in only one direction. A walking bomb with a short fuse. They are portable once Mario stomps them. They also appear in bubbles. A mummified Buzzy Beetle that periodically ducks and bears spikes. A shy ghost that stops moving when Mario looks at it. A shy ghost that turns into a block when Mario looks at it. A chain of Boo Buddies that bounce around the room nonstop. They are usually transparent, which is when they are harmless, but periodically will turn opaque, which is when they are dangerous, to dive at Mario or Luigi. A fire-spitting statue of Bowser. A saw blade that follows a designated path. A turtle dressed in football gear who charges at Mario. All types of Chargin' Chucks take three stomps to defeat. Clappin' Chuck: Jumps straight upwards and claps when Mario approaches. Splittin' Chuck: Splits into three Chargin' Chucks. Passin' Chuck: Has an endless supply of footballs to kick at Mario. Lookout Chuck: Charges directly at Mario once it appears on-screen, and can jump up vertical walls. Other Chucks revert to this after one stomp. Confused Chuck: Has an endless supply of baseballs to throw at Mario. Diggin' Chuck: Uses his shovel to dig up rocks that roll towards Mario. Additionally, a diagonally-travelling Clappin' Chuck, as well as a whistle-blowing Chuck, exists. A small fish that slowly swims back and forth. They also are found in bubbles; once popped from them, they flop across the level. Boo Buddies flying in a circle formation. The green variety moves slowly while the red variety is as fast as Mario and Luigi. A slow-moving ceratopsian dinosaur. When jumped on, it turns into a Dino-Torch. A tiny Dino-Rhino that breathes fire. Boo Buddies found in a group that disappear and reappear. A Koopa Troopa skeleton. It falls apart when Mario stomps on it, and after a short time it will reform its body. It can also throw bones at Mario. A dinosaur-like ghost that floats in zigzag patterns. A spiked obstacle that falls from the ceiling. These rare Jumping Piranha Plants spit fireballs. A jumping ball of fire that leaves fire behind as it jumps. A Lakitu-like Boo in a cloud, fishing with a blue flame. A Lakitu fishing with a 1-Up Mushroom. If Mario takes the bait, the enemy will turn into a normal Lakitu. A black fur ball that follows a set path. A hopping statue of Bowser. A round creature. After stomping them, Mario can carry them for a short distance. Some Goombas come floating in bubbles. A fireball that slowly circles platforms. A carnivorous plant that jumps out of a pipe. After its transformation, the Kamikaze Koopa attempts to hit Mario or Luigi by spinning around in its shell and dashing towards them. Green Koopa Troopa: A turtle that will walk off edges. Red Koopa Troopa: A turtle that paces steadily back and forth on platforms. Blue Koopa Troopa: This turtle slowly walks back and forth on its platform. When not in a shell, they kick empty shells at Mario. Yellow Koopa Troopa: This turtle walks towards Mario and drops a coin if stomped. A shell-less Koopa Troopa. The blue ones will kick a shell if they come in contact with one. If a shell-less Yellow Koopa Troopa jumps into a shell, it becomes a lethal Kamikaze Koopa. A turtle that rides in a cloud and throws Spiny Eggs down at Mario. If Mario hits him with a shell, he can ride in his cloud for a limited time. A Lakitu that lives in a pipe and throws Spiny Eggs at Mario. An invincible ball of lava found in castles. An electrical spark that circles platforms. A Koopa sorcerer in a blue robe. He changes Rotating Blocks into various enemies and items. A mechanical version of Bowser. After stomping them, Mario can pick them up and use them as weapons. A giant Monty Mole that lives underground. A black, star-like creature that jumps up and down. A mole that pops out of mountains and the ground. They move slowly for some seconds, revealing themselves, before suddenly smashing almost anything on their way. After some seconds later, these obstacles move slowly back up. A carnivorous plant that lives in a pipe. A mobile cactus with a spiked head. If Mario is riding Yoshi, Pokey will have five sections instead of three. A fat, spiny fish that swims in the water. A blue dinosaur that squashes down when stomped. A sleeping fish that will chase after Mario if it is awakened. These obstacles move up and down, blocking the path. They come down from the ceiling or up from the floor. Most do not retract all the way, leaving their point exposed. A single-spiked red beetle that climbs around walls and platforms. Lakitus throw these. When they hit the ground, they hatch into Spinies. A fat turtle that stomps the ground and sets fire to everything below him. A shell-less, flying Koopa Troopa. Some blue ones have flashing capes, and drop a Cape Feather when stomped. A green bat that lives in caves. A tiny stone that hops around. A large stone that drops as Mario approaches. They fire Torpedo Teds that are invincible to all available forms of attack. An indestructible cannon. It shoots an endless number of Bullet Bills; however, it does nothing if the player is near it. A spiked urchin that circles blocks underwater. A happy yellow caterpillar. When Mario jumps on its head, it turns red and moves faster. Green Winged Koopa Troopa: A Green Koopa Troopa with wings. Jumps around aimlessly. Red Winged Koopa Troopa: A Red Koopa Troopa with wings. Flies around in a set area. Yellow Winged Koopa Troopa: A Yellow Koopa Troopa with wings. It never flies, but it hops over shells that are kicked at him. Unlike regular Lava Bubbles, Zigzag Lava Bubbles are never found in lava; instead, they are always in the air. They bounce off any walls they run into in an attempt to hurt Mario or Luigi. Four fire-spitting triceratopses. They guard the exit of all Fortresses. The boss of Donut Secret House. He moves around the room, invisible, then suddenly reappears. Boss of castle #1, located in Yoshi's Island. He tries to push Mario into a pool of lava while spitting fireballs. Boss of castle #2, located in Donut Plains. He runs up the walls of his room, trying to drop onto Mario. Boss of castle #3, located in Vanilla Dome. He pops randomly out of seven pipes along with two fake versions of himself. Boss of castle #4, located in Twin Bridges. He spins around the room in his shell, stopping to shoot fireballs. Boss of castle #5, located in the Forest of Illusion. He runs up the walls of his room, trying to drop onto Mario. Boss of castle #6, located in Chocolate Island. She pops randomly out of seven pipes along with two fake versions of herself. Boss of castle #7, located in the Valley of Bowser. He tries to push Mario into a pool of lava while spitting fireballs. The final boss. He hovers above in his Koopa Clown Car, dropping Mechakoopas and Big Steelies. There are a total of six power-ups that provide transformations in the game, with one being exclusive to Yoshi. 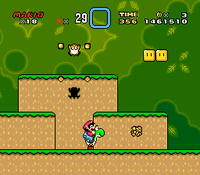 Most power-ups emerge from the blocks populated in levels, and players are able to carry an extra item in their reserve slot if they are already powered up. While the Super Mushroom, Fire Flower, and Super Star return, Super Mario World introduces the Cape Feather, which gently floats down when they appear on screen as well as being able to be spawned from defeating Super Koopas with flashing capes. The new Power Balloon is a rare item used in a few levels and serves as a temporary transformation for Mario and Luigi. In addition to the power-up items, Mario and Luigi can encounter other level features that help them progress through the level, such as 1-Up Mushrooms granting them extra lives or Keys and Keyholes granting them access to secret levels. N/A N/A Small Mario is default and weakest form Mario or Luigi starts with. If he touches an enemy from damaging areas, such as their sides, as well as damaging obstacles, he loses a life. Super Mushroom Super Mushrooms turn Mario or Luigi into Super Mario/Luigi. They can sustain a hit from most obstacles and revert to Small Mario if they get hit. When Super Mario or Luigi hit blocks, they spawn with more powerful items such as Fire Flowers or Cape Feathers. 1000 points are awarded. File:FlowerSMW.png Fire Flower Fire Flowers turn Mario or Luigi into Fire Mario/Luigi, enabling them to launch small fireballs that defeat enemies and give out coins when defeated. 1000 points are awarded. Cape Feather Cape Feathers turn Mario or Luigi into Caped Mario/Luigi. They can spin their cape to defeat enemies as well as slow their descent while the jump button is held down. Caped Mario/Luigi can fly if they are given a running start. 1000 points are awarded. Power Balloon Power Balloons turn Mario or Luigi into Balloon Mario/Luigi. He can float for a limited time, and extra Power Balloons replenish the time spent on the air. No points are awarded upon collecting the item. Super Star Super Stars make Mario or Luigi become Invincible Mario/Luigi temporarily, allowing Mario and Luigi to defeat most enemies by running into them. If the player collects more stars in blocks while invincible, it extends the duration of the invincibility. 1000 points are awarded. Enemies defeated while invincible count towards points eventually becoming 1-Ups or 2-Ups, depending on the enemy. Yoshi's Wings Yoshi's Wings grant Yoshi the ability to fly and enter Coin Heaven. They turn any Yoshi blue after completion, making this the only way to get a Blue Yoshi outside Star World. 1-Up Mushroom If Mario or Luigi collects one, he will get an extra life. These mushrooms may also come from eggs if Mario or Luigi is already riding Yoshi as they find them from a block/pass them by. 3-Up Moon If Mario or Luigi collects one of these very rare items, they both get three extra lives. Coin When Mario or Luigi collects 100 coins, he will get a 1-Up. Gray Coin Pressing a Gray P Switch turns all enemies into Gray Coins for a limited time. If enough are collected, they create extra lives. File:Berry.png Berries Eating ten red berries in one stage will cause Yoshi to lay an egg with a power-up. Two pink berries will produce a coin-throwing cloud. Green berries add 20 seconds to the time limit. A berry is also worth the same as a coin. Dragon Coin If Mario or Luigi collects all five or more on one stage, he will get a 1-Up. 1000 points are awarded, then double for each one collected. Key and Keyhole If Mario or Luigi grabs a key and puts it in a keyhole (which is hidden in a level), a secret level will be unlocked. P Switch and Gray P Switch When a blue P Switch is pressed, blocks transform into coins and vice-versa, and some invisible blocks will be revealed. If a Gray P Switch is pressed, some enemies, such as Spinies, transform into Gray Coins. After a short period of time, the changes made by either switch revert to normal. Jumping Board Jumping on a board will allow Mario or Luigi to jump much higher than normal. Grab Block A dark blue block that can be picked up and carried. Once grabbed, it can be kicked away to defeat enemies. Magic Ball An item that ends the current stage when touched. It appears only in the Sunken Ghost Ship. Baby Yoshi If Mario or Luigi passes nearby a lone Yoshi egg, it will hatch into a Baby Yoshi. The player must feed the Baby Yoshi five enemies, grab blocks, or one power-up to grow into an Adult Yoshi. Every time a Baby Yoshi eats an enemy, the player will receive a coin and 200 points. 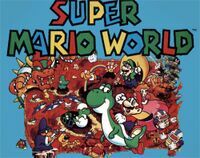 A number of changes were made to Super Mario World when it was released internationally following its initial Japanese version. This included translating the Japanese names and words and tweaking various levels to make the game easier for international audiences. Yoshi can eat the dolphins in the Japanese version. Yoshis can eat the Dolphins as if they were regular enemies in the Japanese version of Super Mario World, but not in the international versions of the game, likely due to them not being enemies. 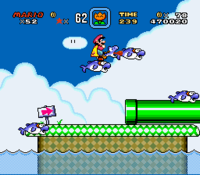 However, this change was later reversed in the remake, Super Mario World: Super Mario Advance 2, allowing Yoshis to eat the dolphins in the non-Japanese versions of the game as well. Donut Plains 2 has an added ! Block after the three ? Blocks near the beginning of the level. Similarly, Vanilla Dome 1 has an added Cape Feather in one of the Rotating Blocks in the structure found early in the level in the international version. The secret exit to Chocolate Island 3 was made more conspicuous through the use of two additional arrow signs, rather than one sign found in the Japanese version. In Donut Secret House, the walls at the end of the two main rooms were extended a bit to fill the whole screen. In the Sunken Ghost Ship, the three 1-Up Mushrooms at the bottom of the Ghost Ship are absent in the Japanese version. #3 Lemmy's Castle has a time limit of 400 seconds instead of 300 seconds. 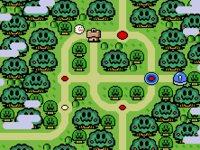 Funky also provided the players more time in the international versions of the game via the presence of nine green berries instead of the original three in the Japanese version; as having Yoshi eat green berries adds 20 seconds to the timer, this meant the international players could accumulate triple the extra time than in the Japanese version of the game. In the Japanese version, the coins at the end of Funky spell out "YOU ARE SUPER PLAYER!!" while in international versions of the game, more coins were added to correctly say, "YOU ARE A SUPER PLAYER!!" Both the file select and mode select title screens change between the different versions. In the file select screen, the Japanese text was changed to English for international releases, and in both cases, 1991 was added to the original's 1990 copyright date to reflect when the North American and PAL versions were released. The logo was also changed to make the shadowing of the letters less pronounced and the "TM" was rewritten in the same lettering style as the title itself. As shown in the comparison of the file select screens below, the PAL version differed from both the Japanese and North American releases in height. Each version also has its own marker to denote whether all 96 exits were found or not. The sign at Yoshi's house was originally written in Japanese script. All instances of Japanese names occurring in-game were changed to English. The sign at Yoshi's House was changed from katakana (Japanese script) to the English alphabet. Also the sign has some shade in the international versions. The enemy names were all translated as well, although rather than Japanese script, they were written in romaji (English letters) in the Japanese version itself. This includes the credits, the writing on Reznor's wheel, and the sign on Bowser's castle. The signs on Reznor's spinning wheel and on Bowser's castle were changed from their Japanese names to their English names. In addition to being translated, various other changes were made to the level names. While block numbers were used in the original Japanese names, the numbers in the international version match the font style used in the lettering. In the Japanese version, all level names were followed by 「コースｘ」, "Course X", but in the international version, the names were simply numbered (i.e. 「ヨースターとう　コース１」, "Yōsutā tō Cōsu 1", changes to "Yoshi's Island 1", instead of "Yoshi's Island Course 1"). Cheese Bridge Area, Cookie Mountain, Forest Secret Area, and Chocolate Secret's Japanese names were all followed by 「コース１」, "Course 1", but as there were no additional levels sharing these names, the numerical designation was dropped for the international versions. However, the Special Zone levels were not numbered. Gnarly and Tubular were both 「おたのしみ　コース」 (Fun Course), Way Cool and Awesome were both 「マリオスタッフもビックリ　コース」 (Even the Mario Staff is Shocked Course), Groovy and Mondo were both 「スペシャリストのための　コース」 (Specialists' Course), and Outrageous and Funky were 「チャンピオンシップの コース」 (Championship Course). The flavor text after defeating a Koopaling and destroying their castle was the same for every Koopaling in the Japanese version, and thus more generic. In international versions, each Koopaling is given their own flavor text. While various enemies change designs after the game is changed to the Fall setting, in the credits, the replacements are given new monikers in the SNES version; in the Super Famicom and Game Boy Advance versions, their name remains the same. The somewhat odd title of "Total Director" was changed to "Main Director", "Back Ground" was corrected to "Background", and all instances of "Programer" were changed to the "Programmer" spelling for the international release. "C.G. Designer" was elaborated upon as "Character Graphic Designer" outside of Japan, and various other titles were tweaked, with "Course Director" becoming "Area Director", "Course Editor" changing to "Area Data Input", and "Player and System Programer" becoming "Mario and System Programmer." The spacing of certain words was also tweaked, and a colon was added to "Special Thanks" in the international version. Dayv Brooks was added to the "Special Thanks" list for his translation work on Super Mario World. For a complete list of media for this subject, see List of Super Mario World media. Title Screen - The theme played on the title screen. The Super Mario All-Stars version of Super Mario World gave Luigi a more distinctive sprite where he is taller, thinner and animates differently, while in the original he is simply a palette swap of Mario and his moves are identical to Mario's. Super Mario World was remade for the Game Boy Advance as the second installment in the Super Mario Advance series, Super Mario World: Super Mario Advance 2. Some of the more notable changes include new sprites for Luigi, the maximum amount of lives being 999 that can now be saved, and a list of levels showing whether the secret exit and the Dragon Coins have been found. Super Mario World is one of the 21 titles included on the Super NES Classic Edition. Super Mario Bros. - If the player waits on the Special Zone map for two minutes, a cover version of the overworld theme will start playing. Super Mario Bros. 2 - Unaltered Ninjis reappear, and Bullet Bills resembling Pidgits appear in the Fall. Pokeys also return. Super Mario Bros. 3 - The Sunken Ghost Ship was once an airship from this game. Also, all of the Koopalings return here. Bob-ombs reuse their keyless artillery graphics here. Mario Roulette - Many sounds and graphics from here appear in this game. Mario Paint - Many sounds and graphics from here appear in this game. Super Mario Kart - Lakitu is near identical in appearance in this game and many tracks in this game are based on levels here. The music that plays in the Ghost Valley and Bowser Castle courses are remixes of the music from the Ghost Houses and the final boss theme, respectively, from Super Mario World. Mario's Time Machine - Many sounds and graphics from Super Mario World appear in this game. Mario is Missing! - Many sounds and graphics from here appear in this game. Super Mario World 2: Yoshi's Island - This game is a prequel to Super Mario World, though the stories are practically unrelated in sharing some settings and uses Yoshi as the main character, although there are nine Yoshis (or ten in the Game Boy Advance remake) for each stage for each zone. Also, Yoshi's sound effects from here were reused in this game. Super Mario RPG: Legend of the Seven Stars - The Star Road found here is destroyed by Exor and it is revealed that Geno is from here. Yoshi's Island also returns as Yo'ster Isle, and a rendition of the overworld theme from this game plays upon first meeting Gaz. Also, the overworld theme can be heard while singing a character to sleep. Super Mario 64 - The idea of Switch Palaces is, in a way, carried over into this game. Also, Yoshi references this game when he says, "It has been so long since our last adventure!" Super Mario Bros. Deluxe - The first part of the background music heard in the Special Zone was arranged as the "Mystery Room" theme. Super Smash Bros. - Mario and Luigi's down special, Mario Tornado and Luigi Cyclone, are similar and could be based on the Spin Jump that originated in Super Mario World. Paper Mario - The first few notes of the Super Mario World overworld theme can be heard in this game's title screen music. Also, one of the tracks played by the radio in Koopa Village is the ending theme of the same game. Luigi's Mansion - One of Melody Pianissima's musical quizzes names this game as an optional response. Super Smash Bros. Melee - There is a Super Mario World-themed level called Yoshi's Island. Banzai Bill also returns, and Mario can use his Cape as his side special move. Trophies of the Koopa Clown Car and Mario riding Yoshi are collectible. Mario & Luigi: Superstar Saga - In a room in Woohoo Hooniversity, four question blocks from previous games (the names of which are even stated in their descriptions) can be seen; one of them is the question block from Super Mario World. 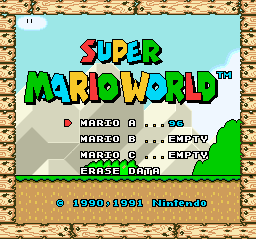 A cover of the overworld theme from Super Mario World is used for some of the minigames. The Koopalings are also fought in the same order as in Super Mario World. Super Mario Sunshine - When F.L.U.D.D. scans Mario, a video of Mario battling Iggy in this game can be seen. Paper Mario: The Thousand-Year Door - Riding Yoshi came from this game. Also, if Mario gets an email from the RDM, a tone that is a cover of the music that plays when Mario destroys a castle in this game plays. If Mario gets an email from Peach, the title screen music from this game plays. Mario Party Advance - The results screen music after the player runs out of Mushrooms in this game is a cover of the overworld theme from Super Mario World. Goombas also appeared in the form they appeared in the game as well. Super Smash Bros. Brawl - A short demo of Super Mario World is playable, and the Yoshi's Island stage returns. Mario's Cape move returns from Melee as well. Also, Bowser uses his Koopa Clown Car in the Subspace Emissary. Finally, the title theme and ending theme are covers and plays on the Delfino Plaza stage, as well as the castle theme on the Luigi's Mansion stage. Yoshi's Final Smash, Super Dragon, is based on the powers he can obtain from a Koopa shell, specifically the powers from a red Koopa Troopa and blue Koopa Troopa. Hot Head makes an appearance as an item in Super Smash Bros. Brawl, as well as a trophy. Blargg appears as a sticker in this game. New Super Mario Bros. Wii - Yoshi reappears in this game, behaving exactly as he did in Super Mario World. The Spin Jump also makes a return. Part of the music that plays in the castle/fortresses in this game is used for the castle levels in New Super Mario Bros. Wii. Super Mario Galaxy 2 - A cover of the music from the Ghost House levels is used for Haunty Halls Galaxy and Boo Moon Galaxy. A cover of the athletic theme is used for Hightail Falls Galaxy (and also the music that plays during the mission for Starshine Beach Galaxy, "Purple Coin Beach Dash"). Sound effects from Super Mario World are reused, such as the sound when Yoshi is mounted, when a door is opened and when the Switch Block time limit (the Teleporter time limit in this game) is about to run out. Yoshi reappears in the game. Yoshi's House also returns in the Sky Station Galaxy. The Bonus Game theme from this game is used as the music that plays when touching the notes in the Puzzle Plank Galaxy. Mario Sports Mix - A remix of the athletic theme from this game is available as one of the songs in Harmony Hustle. Super Mario 3D Land - The sound heard when Mario exits a level after beating it in Super Mario World is present in this game after Luigi's letter is seen. Certain note sets play the Bonus Game theme. New Super Mario Bros. 2 - Reznors returns in this game, as well as the cover of the battle theme. Also, the chime that can be heard while the game loads sometimes plays a small part of the Super Mario World overworld theme, and in World 4, Super Mario World's snow level background is reused. New Super Mario Bros. U - This game seems to be based off of Super Mario World, with similar backgrounds and level styles. A Sumo Bro returns as the boss for the level Screwtop Tower. Baby Yoshis reappear as well. It also uses a single, continuous world map, similar to this game. Super Mario 3D World - Along with having a similar name, this game features Chargin' Chucks and Goombas (renamed Galoombas), both of which haven't been seen in a Super Mario platform game since Super Mario World. 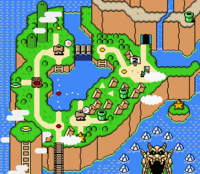 At the beginning of The Great Tower of Bowser Land is a Bowser Mobile, which, hitting it occasionally causes Super Mario World sound effects to play. The artwork of Beach Koopa for this game is reused as a stamp. Super Smash Bros. for Wii U - Like in Super Smash Bros. Brawl, a demo of Super Mario World can be found under Masterpieces. Two new songs based on ones from Super Mario World's music, namely "Fortress Boss" and "Super Mario World Medley" (Overworld theme, portions of the bonus game theme, Star World, and Super Star) appear as the selectable songs in the "My Music" section. Yoshi's Island (Melee) returns as a playable stage in Super Smash Bros. for Wii U.
Super Mario Maker/Super Mario Maker for Nintendo 3DS - One of the level styles is Super Mario World and part of the ending theme is used in the credits. A cover of the music that plays in the Donut Plains, Twin Bridges and Chocolate Island parts of the world map can be heard on the map screen for 10 Mario Challenge (Super Mario Challenge in the 3DS port). Super Mario Odyssey - A piano remix of the overworld and underwater themes from Super Mario World can be heard on radios in New Donk City. When controlled by Mario, Moe-Eyes sometimes hum the ending theme of Super Mario World while walking around with its sunglasses on. A remix of the final boss theme from this game plays when Mario captures Bowser. The music that plays in the bonus areas and Bonus Game was remixed as the music that plays during some of the challenge areas in this game. WarioWare Gold - This game contains a microgame that is based off of Super Mario World, which involves Cape Mario collecting a certain amount of coins. Several graphical errors are present in the game. Of note is that the Magikoopas' unique palette has their colors ordered incorrectly, resulting in the area that should be occupied by the lightest shade of blue instead having the darkest. This is fixed in the Game Boy Advance version by giving them the normal blue palette. The Koopa bosses are all depicted with three fingers on each hand. This is fixed in the GBA version. Most of the Koopalings' sprites are made to resemble their Super Mario Bros. 3 counterparts (likely to be more easy to recognize), even when the result would be off-model from their artwork, such as with Iggy only having one tooth and Wendy having a white bow with red spots. Morton, Roy, and Ludwig are given green, blue, and yellow palettes respectively in gameplay. In the credits, they are given turquoise, gray, and pink palettes, respectively, However, in order to match up with their Super Mario Bros. 3 palettes, they should be given the gray, pink, and turquoise palettes, respectively. The credits also give Ludwig Morton's teeth. Lemmy is depicted as being yellow, and has large fangs and spikeless arm cuffs, likely owing to having the same body as Wendy to conserve graphic space. Iggy is accidentally given Larry's hair, leaving Iggy's unused except for in the credits. This error remains in the GBA version. Bowser is depicted as being primarily green. This is fixed in the GBA version to make him primarily orange. In addition, he lacks the spiked cuffs on his arms. This error is kept on the GBA version. Bowser's sprite was redesigned in the Super Mario World theme of Super Mario Maker. Yoshi's arms are orange, as are those of the rest of his species. Due to how Chargin' Chucks' graphics are assembled, their graphics have many errors. Most conspicuously, their heads come off for a frame when they are hit. Other errors include their facemasks going behind the rim of their plastrons in certain poses, and the facemasks also being visible in front of the clapping effect. They are also assigned a green palette in-game despite being colored with blue highlights in their artwork and being given a blue palette in the credits. They also have a star in their artwork, which is absent in their sprites. Despite Dry Bones being skeletal Koopa Troopas, they are depicted as being far larger than their living counterparts. They also have neck and arm bones in their sprites, but not their artwork. The two lower tiles on the back-facing Climbing Koopas appear to be switched, as the lower part of the shell moves in the opposite direction as the upper part of it, and the limbs aren't oriented as they are in the front-facing sprites. Spike Tops are seemingly depicted with six legs in the game, despite seemingly having four in their artwork. Despite being given green feet in their artwork, Goombas are assigned the yellow palette in-game, with the yellow only affecting their feet anyway. Monty Moles have incompatible designs between their jumping and running sprites, with the former having a split lip and the latter having a smooth curve for a mouth. The GBA remake continues this with Mega Mole's unique defeat sprite seen by having Yoshi eat one while playing as Luigi. Due to how Mechakoopas' tiles are assembled, the sprite of one getting up from being stunned appears to have half of an extra lower jaw under its full jaw and half of an extra foot over its full foot. Big Boos have lower fangs and white eyes in their sprites, but have the same faces as normal Boos in their artwork. Bony Beetles have the same falling apart animation as Dry Bones, with Dry Bones' heads being particularly conspicuous. In the Japanese version, the message spelled out with coins in Funky reads "YOU ARE SUPER PLAYER!!" in a typical case of Engrish. The Western versions fix the grammar to "YOU ARE A SUPER PLAYER!!" thus adding more coins to the level. In the manual description for Reznor, Bowser is referred to simply by his Japanese name and surname of "Koopa," when all other instances in the manual refers to him by his first name. The English localization refers to as the enemy known as Kuribon in Japan as "Goomba," either in an accidental mistranslation or a deliberate attempt to group the two creatures together, possibly to seem more familiar to players. This led to confusion in Western depictions as to whether or not the two creatures were the same thing or not until Super Mario 3D World retranslated them as "Galoombas," though Mario Party Advance seemingly made an earlier attempt with "Goombob." Super Mario World received universal critical acclaim. The game was placed 16th in the 100th issue of Nintendo Power's "100 best Nintendo games of all time" in 1997. The game placed 47th in the 200th Issue of GameInformer's "Top 200 Games of All Time". Wii Lucas M. Thomas, IGN 8.5/10 "Super Mario World could be argued to take the crown for greatest 2D Mario platformer, and as such earns almost immediate recommendation for download to your Wii. The recommendation is tentatively withheld, however, pending examination of your history of ownership with the game, its ported Game Boy Advance iteration, Super Mario Advance 2: Super Mario World, has become one of the best-selling games of all time on Nintendo's handheld systems since its release five years ago. The portable package is perfectly playable, meaning you should save your Points if you're one of the millions of gamers to own it there, in cartridge form. Otherwise, download away. Especially you, stalwart Sonic supporters; the white flag is waving, the war now at an end. Come experience Mario's adventures, and the debut of his dinosaur friend." Wii Alex Navarro, GameSpot 8.5/10 "Of course, odds are that many have experienced this game in one way or another over the years, be it with a copy of the original SNES release, or with 2002's fabulous GBA remake. If you own either of those and still have the required systems to play them, this VC version becomes significantly less necessary. However, if you're too young to have played the original game back in the day (or just spent most of the '90s in the era's equivalent of a disco haze) and never got around to picking up the GBA version, there's no excuse not to give Super Mario World a try now." Super Mario World was bundled with the Super Nintendo Entertainment System making it the most sold game for SNES, selling 20 million copies. Dinosaur Land was drastically different than the final version, possessing an appearance similar to the various kingdoms of Super Mario Bros. 3. Specifically, it was to feature things such as Toad Houses (which could possibly mean that Toads were once considered to populate Dinosaur Land) and more Super Mario Bros. 3-style Fortresses. In addition to this, the game originally had the subtitle "Super Mario Bros. 4" on the title screen. The balls on Iggy's and Larry's platforms can be destroyed by the sliding attack, as can the Grinders (using a triangle block). This results in glitchy graphics, most likely because the developers did not intend for these enemies to be defeated. The same thing happens if Mario does a nose diving in the second level of the Bowser battle. The Big Steely is defeated as a red sprite of Princess Toadstool's head. In order to do this glitch, the player must go to the end of Chocolate Island 3. Under the goal, the player must jump off Yoshi to the Giant Gate so that the screen does not scroll up. If done correctly, Mario is barely seen when he finishes the level, and because Mario is not present on the bottom of the screen, the screen begins to flicker in many colors as the stage begins to fade out. When he comes back to the overworld map, the entire world is glitchy and colored with red and blue. If Mario visits Forest of Illusion or Valley of Bowser and comes back to the main overworld, the entire world will be ivory colored instead. The glitch ends if the player completes a level or visits Star Road. Twenty-three people were listed in the credits of Super Mario World, including notable Nintendo composer Koji Kondo for the sound programming and Shigeru Miyamoto as the producer. Takashi Tezuka was the overall director of the game, listed as the "Total Director" in the original Japanese version of the credits. For this subject's image gallery, see Gallery:Super Mario World. The 2D graphics with linear transformations in this game would later be reused for Super Mario World 2: Yoshi's Island and Wario Land 4. Additionally, the Mario, Luigi and Yoshi sprites were also reused for Mario is Missing! and Mario's Time Machine. Although Mario and Luigi have back pockets, they are not shown with those details in their artwork. ↑ Interview with Shigeru Miyamoto in Mario Mania Player's Guide, p. 32. ↑  "SUPER MARIO WORLD’S RADICAL SPECIAL COURSES… IN JAPANESE!" Article. ↑ As explained by Dayvv Brooks, formerly credited as "Dayv Brooks", on July 18, 2012. This page was last edited on April 19, 2019, at 01:32.